As an accountant, your clients will often need advice on ways in which they can add value to their business. 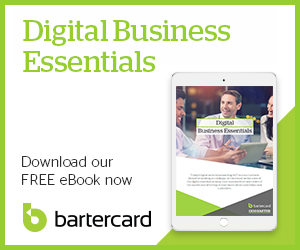 In order to confidently advise on how Bartercard can grow your client's business, we have written this eBook “The Accountant's Guide to Bartercard”. Wouldn't it be great to find an easy and convenient way to improve the way you do business, that leaves you with more time for family and life outside of work? This is where we can help. We want you to get the most out of your business and would love to explain how Bartercard can make that happen. Did you know SME's make up about 97% of businesses in New Zealand? Or that you can grow your sales by 10% or more within the first 12 months of becoming a Bartercard member? Check out our New Zealand Business Trends & Facts presented to you in an infographic. A one stop guide for everything you need to know about the Bartercard community in New Zealand. What will you find in this Handbook? How Bartercard works, Bartercard Search, Travel, Property, Sponsorship and much more! We’ve created this free resource to help you understand the changes being made to the Anti-Money Laundering (AML) and Countering Financing of Terrorism (CFT) Act 2009, coming into affect July 1 2018. You'll gain valuable insights into who these changes affect, and what those businesses need to do. This eBook introduces and discusses some of the obligations imposed on reporting entities.